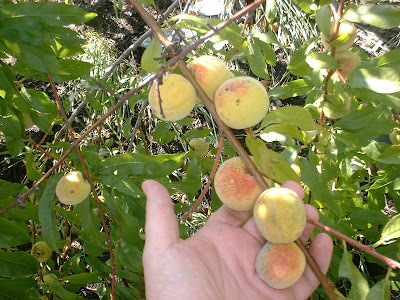 I was looking at my almond tree yesterday and contemplating that it is grafted on a peach root stock. I noticed that the fruit on the tree has two different looks - one just like a peach and the other smaller and more like an apricot. 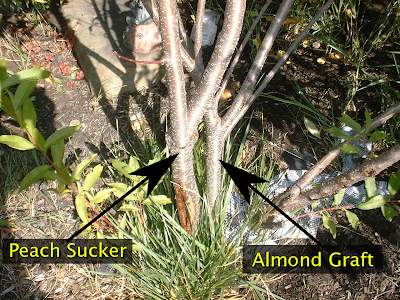 Then I realized that a sucker from the root had grown to greater height than the almond! 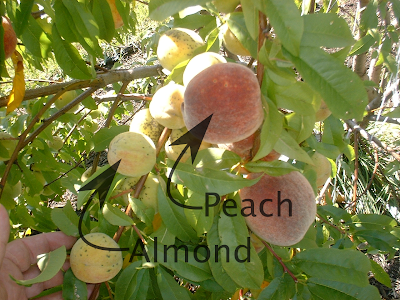 I have a tree that produces almonds and peaches! Now most people would want just the almond, but I am perfectly happy to have both! The also is the added bonus that the tree can cross pollinate itself! 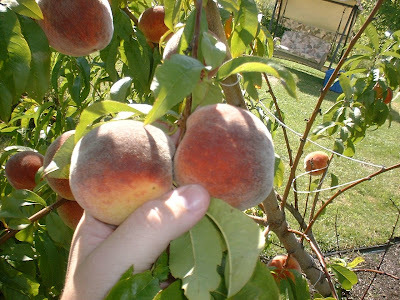 The time to pick the peaches is when they easily separate from the tree. So it will be a day or two before I can enjoy them -- I cannot wait!